With today's competitive market, everyone is looking for that extra edge in business. We pride ourselves in helping flourishing businesses grab that edge. It's not as simple as having a website anymore. Today's Websites and Web Applications need to demonstrate usability and communicate to the user, solve problems, and deliver content. Whether your company needs something as simple as a brochure website with search engine optimization or a sophisticated web application we deliver. Web 2.0 was the transition from websites to web applications. We are experts in creating these applications. Social Networking? Blogs? No problem. SEO is a vital piece of your website. Without it people can't find you. Our methods will help bring your site to your customers. 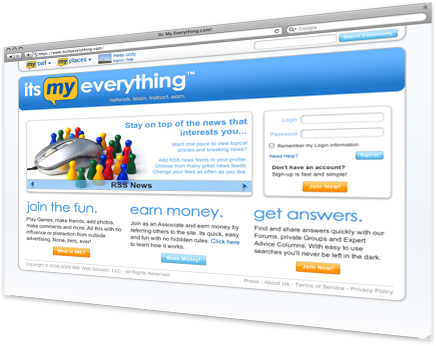 Users either make a connection with a site or not. We'll make sure your client stays on your site with great usability and design. Web services are becoming more standard everyday. Credit card processing, ssn verification and distance calculation all use modern web services. "Servalsoft was in charge of developing my entire website. Ground up, graphics and all. Their team came through with an outstanding product that was everything I asked for and more. The best part about working with them was their service. Any question that was asked or problem that came up during testing was answered and/or resolved in an extremely prompt manner. I never felt like their team was not paying attention to my needs and they were always able to solve my problems. That's an extremely difficult combination to find in a development company. They are small enough so you do not get lost in the shuffle but large enough to handle any and all tasks promptly and accurately. I would use them again and again and recommend them to anyone looking for a developer."